Listening is clearly central to the practice of both counselling and psychotherapy. Given this, it is quite extraordinary how little thought has been given to the nature of therapeutic listening and to the cultivation and evaluation of the therapist as listener. 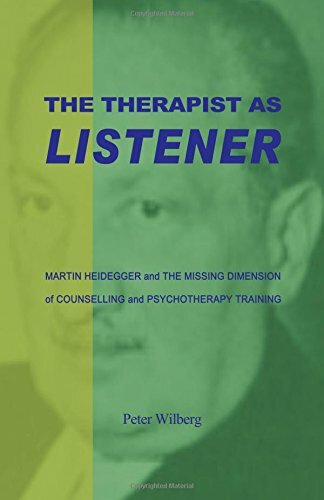 Instead, listening is a subject marginalised in both the theoretical literature on psychotherapy and in the practical training of counsellors and psychotherapists .In this collection of essays and articles by Peter Wilberg, the thinking of Martin Heidegger provides the platform for an exploration of the deeper nature of listening - not simply as a passive prelude to therapeutic or diagnostic responses, but as a mode of active inner communication with others. What Wilberg calls Maieutic Listening is not a new form of psychotherapy, but the innately therapeutic essence of listening as such - understood not as a mere therapeutic 'skill' but as a our most basic way of being and bearing with others in pregnant silence.